I looked into our licensing and it turns out we had purchased VirtualCenter Server along with our ESX servers. I set off to configure it by loading a Windows 2003 R2 server with SQL 2005. I then proceeded to install the management software. You need to download the software from VMware and your licensing file. 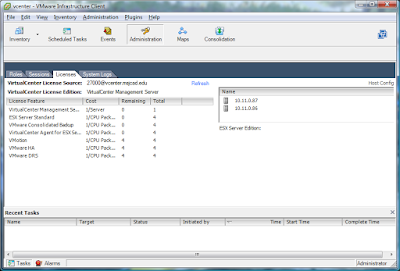 After installing VirtualCenter, I attempted to add my ESX standalone host to the management server. I then got this error "There are not enough licenses installed to perform the operation". 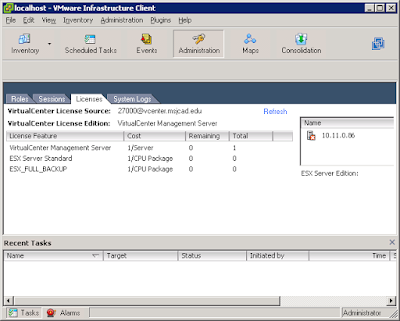 So, I loaded the licenses off my ESX server onto the Virtual Center, restarted the licensing server, but no dice. Same error "There are not enough licenses installed to perform the operation" occurred. At this point I contacted VMware support. I got no where after a week, so I started looking at the problem more myself. I noticed license file and notice the site said "Single Host" next to the license model. I removed the active license, and reactivated it as Centralized, loaded it on my VirtualCenter, BOOM, Works!!! we had the same problem and the problem was the License Server. You should uninstall it and reboot the win23k server, then reinstall the sw. You could get the license server in the vmware web page. Reinstalling the license server and loading the license solved this issue. Be sure that in the license folder there only one license! Good look!